Every path leads to another spectacular view. It’s Fantasyland for the horticulturist and Wonderworld for the masses. Famed Butchart Gardens on Vancouver Island, British Columbia, is a blue-ribbon showplace in one of the loveliest corners of the world. Visitors marvel at the variety and harmony achieved by co-mingling easily recognizable flowers like dainty purple daisies and ruffled pink geraniums with unusual specimens such as teardrop fuchsia and delicate drooping trout lily. Since passing the century mark in 2004, privately owned Butchart Gardens has featured more spectacular scenes than ever within its 55 acres. With different plants in bloom 46 weeks of the year, each season (The Gardens counts five seasons—spring, summer, autumn, Christmas, and winter) brings new items of beauty and interest for the public’s pleasure. Fifty full time gardeners and additional part time staff work in 26 greenhouses year round to supply The Gardens with the best possible plant specimens. Twelve thousand tulip bulbs are imported annually from Holland to provide a dramatic prelude to spring. One and a half million annuals grown on-site plus flowering trees and shrubs fill beds and lawns with a brilliant display of shapes, textures, and colors. Summer is nirvana for plant lovers. Not only are flowers blooming in myriad hues, but also thousands of colored lights transform each night into a glowing floral delight, casting shadows and a magical luster on trees and shrubs. On Saturday evenings fireworks light up the sky, and guest artists perform on the Concert Lawn. Colors peak in mid-October with flaming red and russet maples and 53 varieties of chrysanthemums leading the autumn parade. As the blooming season winds down, guests enjoy greenhouse tours in November. The Twelve Days of Christmas displays are crowd pleasers every year, and visitors enjoy ice skating on the outdoor rink during the winter. Background shrubs take center stage while flowering plants are dormant. The family home on the estate was christened “Benvenuto,” Italian for “Welcome,” and during the winter it is open for tours showcasing memorabilia that chronicle development of The Gardens. In 1904 Jennie Butchart, wife of successful cement manufacturer Robert Butchart, began to beautify an abandoned limestone quarry near the family home. 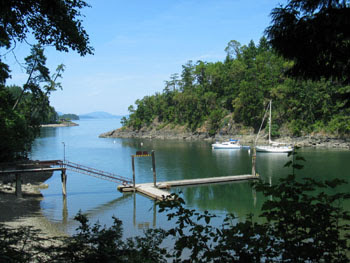 Originally, the quarry was expected to support the cement factory Butchart built in 1898 on Tod Inlet. However, the quarry was soon exhausted, leaving an ugly, empty gravel pit. We captured our reflection in this amazing ball. As a diversion, Jennie set about transforming this bleak sight. Under her personal supervision, top soil was brought in by horse and cart, and other improvements were made. Trees, shrubs, and flowers planted under her watchful eye eventually took shape as the Sunken Garden. Friends and neighbors flocked to see Jennie’s beautiful gardens, and visitors traveling to Vancouver Island spread the word about the floral displays. 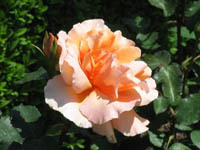 During the 1920’s more than fifty thousand people admired Jennie’s creation, and it began to take on a life of its own. As the concrete business declined, Jennie established a viable business by offering guided tours with a cup of tea, an idea that proved popular with both locals and visitors. Since Jennie’s husband Robert collected ornamental birds from all over the world and kept live ducks and peacocks, many elaborate birdhouses were stationed throughout the gardens. 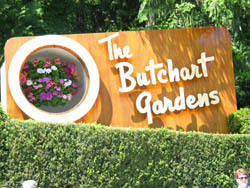 The Butcharts incorporated landscaping visions from their world travels in the form of a Japanese Garden on the sea-side of their home and later an Italian Garden and a Rose Garden. Traditional hospitality is still evident during High Tea in The Dining Room Restaurant when fruit and yogurt as well as a generous selection of tea sandwiches and homemade sweets are served. When you stroll on well-maintained paths meandering through several distinct garden sections and expansive lawns or rest beside one of the many cooling water features, you’re experiencing the result of more than a century of pride and caring from Butchart family members. Getting there: Butchart Gardens is located on Vancouver Island, 14 miles north of Victoria and 12.5 miles south of the Vancouver-Victoria ferry terminal at Swartz Bay. Ferries are also available from several points in Washington, or you can arrive by plane or boat. 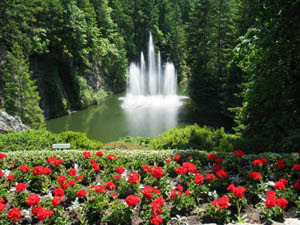 Allow at least three hours to absorb the elegance of Butchart Gardens.